Hikaru Kimura, Mitsubishi Materials' Senior Executive Officer, bows to offer an apology at the Simon Wiesenthal Center in Los Angeles, California, July 19, 2015. Executives from Japan's Mitsubishi Corporation offered a historic personal apology for the company's use of American prisoners of war as forced laborers during World War Two. Mitsubishi executive Hikaru Kimura offered a "most remorseful apology" to 94-year-old former POW James Murphy during a public ceremony Sunday at the Simon Wiesenthal Center's Museum of Tolerance in Los Angeles. Before the ceremony, Kimura and other Mitsubishi executives offered the apology during a private meeting with Murphy. "This is a glorious day," he said. "For 70 years, we wanted this," said Murphy, who was one of about 900 POWs to work in the company-owned mines and industrial plants during the war. 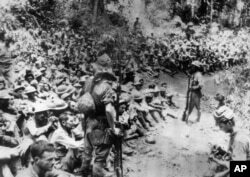 FILE - In this 1942 file photo provided by U.S. Marine Corps, Japanese soldiers stand guard over American war prisoners just before the start of the Bataan Death March following the Japanese occupation of the Philippines. "I listened very carefully to Mr. Kimura's statement of apology, and found it very, very sincere, humble, and revealing," he went on. "And this happened to be the first time that we've heard those words and they really touch you at the heart of the thing." A total of 12,000 American prisoners of war were put into forced labor by the Japanese government and private companies. Thousands of them died. Although the Japanese government has officially apologized for using American POWs as forced laborers, the apology by Mitsubishi is the first ever by a Japanese conglomerate.